Polaris Industries and Eicher Motors launched a mini-pickup truck. Its name is Multix. It looks like an auto rickshaw that has been to the gym. But this mini-pickup truck is more than that. The company targeted at small businessmen, the Multix can also double-up as a generator to light up homes, power tools or even run a DJ console. A joint venture between U.S.-based Polaris Industries and India’s Eicher Motors, the vehicle is designed to be small enough to steer through congested city roads in the South Asian country, but still it comes with an independent suspension system and 225 millimeters of ground clearance to tackle potholed or flooded streets. 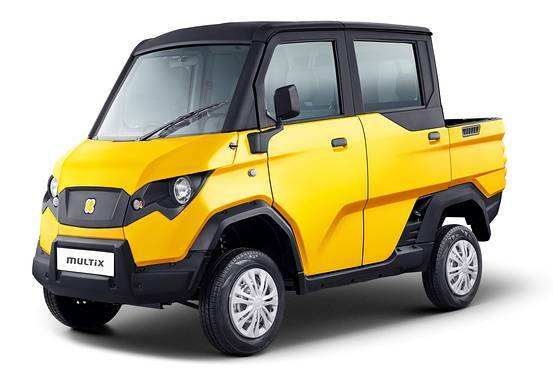 With its 511-cubic-centimeter diesel engine, the Multix can travel more than 28 kilometers to a liter, according to the companies. Its dual-cab can transport up to five people and has up to 1,918 liters of luggage space—big enough for a family vacation. But the pickup’s unique feature is what it calls the X-PORT—which acts as a generator to give out up to three kilowatts of power to light homes, and power professional equipment such as drilling machines, DJ systems, water pumps. “We have identified a large, untapped segment in independent businessmen with an estimated population of 58 million in India, and are committed to create a new and strongly differentiated automotive solution for them through ‘Multix’,” said Siddhartha Lal, managing director and chief executive of Eicher Motors, in a statement. The company also produces motorcycles, tractors and trucks. Eicher Polaris haven’t said whether they plan to export the Multix, which is made in their factory in Jaipur in Rajasthan state. Built with an investment of 3.5 billion rupees, the plant can produce up to 60,000 vehicles each year, which can be doubled if needed, according to the companies. will it come to the Philippines?? ?